As someone who regularly teaches creative non-fiction to university students, I’m always looking for new material. Earlier this year, I came across a highly acclaimed memoir that lasted thirty-one weeks on The New York Times bestseller list. 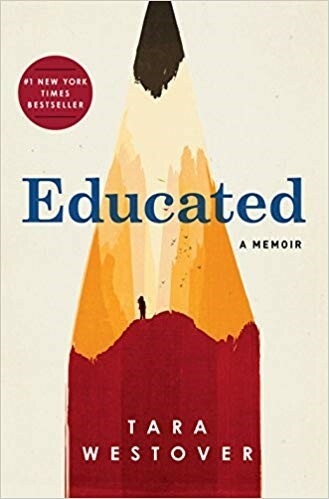 Educated: A Memoir is written by Tara Westover, the youngest daughter of Mormon fundamentalists and survivalists from a remote area of Idaho, near Buck’s Peak. Westover’s father repeatedly preached that the end of the world was imminent and that the right to exist without interference from the government took precedence over all other personal needs. Self-sufficiency from his point of view meant life without any formal education and health care. As a child, Westover was taught to obey, not to question. And when tragedy struck – which was often brought upon by the patriarch’s poor judgment – father still knew best. Family life was marked by dangerous, hard physical labor, poverty as well as the constant stockpiling of supplies, be they canned food or survivalist gear. Paranoid that the government would somehow intervene, the family was prepared to defend their way of life by any means necessary. Keenly aware of her surroundings, Westover noticed – already at the age of seven – that her family was different. Before entering college at the age of seventeen, the young woman had never set foot in a public school. Her education was largely limited to the Book of Mormon and Mormon doctrine. One day, when Westover mentioned that she wanted to go to school, her father quickly rebuked her: “In this family […] we obey the commandments of the Lord.” And that was that. So how was Tara Westover able to gain university admission and later earn her doctorate? Let’s just say her path was filled with numerous obstacles, the greatest of which was her own guilt and shame. Severe burns and deep gashes caused by accidents working with metal in the family salvage yard repeatedly taught the Westovers that life was literally full of suffering and pain. Nobody was spared. The junk yard and the father’s work in construction only secured the family a meager existence. In order to supplement the family income, Westover’s mother, Faye, became a skilled, but unlicensed midwife and herbalist. The chapters dealing with Faye as a midwife and faith healer provide readers with an interesting diversion from other, more grim parts of the book. And grim are the passages about Westover’s abuse. Her older brother, Shawn, put her in her place when she showed interest in make-up, teenage endeavors, and a young man named Charles. In addition to repeated acts of verbal abuse, episodes of physical violence include dragging the teen down the hall by her hair, submerging her face in the toilet, viciously choking her, and encouraging her to commit suicide. Needless to say, Westover lived in terror of her brother’s rage, especially since protection from her parents was virtually non-existent. And so when the young woman learns about the possibility to attend university without a high school diploma, she immediately buys a book to help prepare her for the college entrance exam. University education becomes her one-way ticket out of a culturally scripted, predetermined life. Instead of finding a highly innovative memoir (it is a bestseller after all), Educated is written in a straightforward, accessible manner. It is reflective at times and sprinkled with dialogue in the right places – as are dozens upon dozens of other memoirs. So why did this one attract so much attention? The answer is relatively simple. Educated is an escape memoir without being written like one. It is a good read with a compelling story about people on the margins of society, whom the average person is not likely to meet. And although the prologue is told in a lyrical voice, the rest of the memoir is mostly marked by economy and soberness, even those episodes depicting abuse. It is unusual for a previously unknown writer in her early thirties so temporally close to her subject matter to achieve such distance. Westover’s voice is neither bitter, nor melodramatic. And that is not the only surprise in store for readers. If bookworms are looking for a treatise on the dangers of fundamentalism or a stark condemnation of Mormonism, they might be disappointed. The narrating I explains in the front matter that Educated is neither about Mormonism nor about religious beliefs. Somehow the memoirist gets away with mostly sidestepping those sensitive issues without it negatively affecting the book. And that feat alone makes this book worth reading. It also makes Educated somewhat less likely to isolate those close to the topic. Instead of driving a specific message home, Westover trusts readers to glean their own meaning from her non-fictional life narrative, another feature of fine writing. Absent from the memoir are, for example, passionate monologues about homeschooling or the need for education. Even without them, I found myself truly pondering the legitimacy of homeschooling, a feature of the American educational system I had previously taken for granted. When readers are finished with the book, they might want to listen to the intriguing NPR podcast episode on Fresh Air, in which Tara Westover candidly talks with Dave Davies about her experiences and memoir. Educated is driven by an action-filled plot, sustained tension, and good ole storytelling. It is what it is. Inspiring.